The Wellington Airport, also known as Bondangora Airport, is owned and operated by Dubbo Regional Council. People looking to land or house their small planes at Wellington / Bodangora Airport, including local residents and visitors can obtain permission to use the airport by contacting Council. Landing fees at Wellington / Bodangora Airport will be applicable from 1 August 2018. Operators of Recreational Aircraft can register with Avdata on 02 6262 8111. Regular inspections are not carried out by Council, however a special inspection can be arranged for a fee of $99.00. 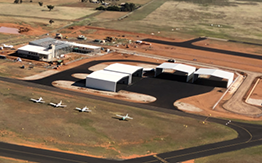 All enquiries please contact Dubbo City Regional Airport (02) 6801 4560 or email airport@dubbo.nsw.gov.au. For emergencies, please call inspecting officers Peter James on 0428 634 034 or Colin Horan on 0429 452 098. Alternatively, contact Council's Customer Service Centre on (02) 6801 4000. World Aeronautical Chart (WAC) No: 345. Strip 05 - Not suitable for departures due to rising terrain. 05/23 - Unsealed central gravel strip 10m wide both directions. Permanent runway lighting is available on runway 13/31. Available by arrangement with BP Dubbo.